Turkey's carved and packed up, leftovers stashed away in Tupperware, the belt is loosened and the shirt's a little bit snugger...means Thanksgiving has come and passed once more. I love Thanksgiving. I'm lucky to have much to be thankful for. Sandy and I just marked nine years of marriage, with much more "really darn good" if not "pantheon" moments and not too many "blahhh" times. We have our girlies, who we love and whom I'm pretty convinced they're all smarter than me already. We have our extended family and good friends and a house that keeps standing and jobs that keep paying and cars that keep starting. Do we have it all? No, perhaps we're not that close, at least materialistically speaking. But we choose to fill our hearts with love and hands with gratitude. It's all part of the reason that Thanksgiving is my favorite holiday...and why I dislike it being trampled over by Christmas every single year. Kinda grinds my gears. Shops being open for Christmas shopping on Thanksgiving? Ugh. Nothing like trampling over someone for $30 off a blender the same day you're supposed to be thankful for what you have. Thanksgiving calls for peace of the soul, Christmas as celebrated secularly calls for not having enough...or for buying, buying, buying to prove your love for someone. Sorry for long preamble, I blame the excess tryptophan flowing through my bloodstream right now. 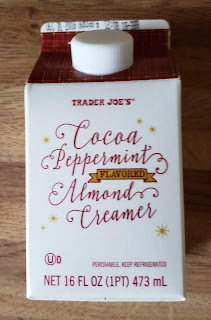 And what does this have to do with Trader Joe's Cocoa Peppermint Flavored Almond Creamer? When I sat down to write this, I really was thinking of this dairyfree creamer in terms of it being a "Christmas" item. 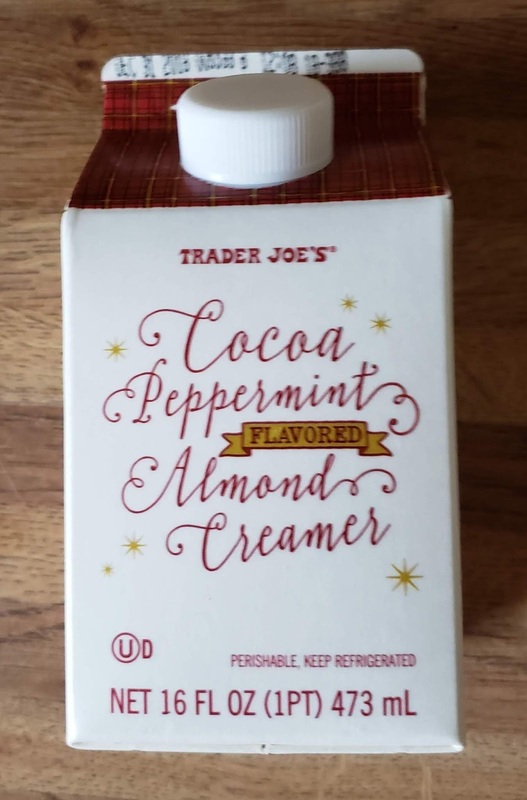 "Cocoa peppermint coffee creamer" just sounds inherently Christmassy, like it should be guzzled by lactose-intolerant Santas all across the land. But of course that's a little bit preposterous, it's more of a general winter/colder weather combo, but explains why even we've had it around for over a week, I'm just getting around to the review now. Save the Christmas stuff for after Thanksgiving, right? It's a decent creamer, though. I poured some in my coffee the other morning and didn't immediately hate it, which is saying something as I usually just do mine black. There's a pleasant balance of mint and chocolate, without either being too overpowering or cloy or sickeningly sweet or anything. Also, there's a little bit of nuttiness too. It's a good flavor, and it didn't color my coffee too tan either. Sandy is a big fan, as she prefers alternate milks and creamers but usually doesn't like almond ones as they can be too thin and watery. "It's almost as creamy as regular cream," she said. I'd take her word for it. So maybe instead of bah-humbugging too much, I can choose once again to be thankful, even for something small like a flavored coffee creamer that I'm not completely enamored with. It's good enough, vegan, dairyfree, at a good value ($1.99! ), and represents a lot of what is right with Trader Joe's as a store. And I got to write about it for a blog I love and an audience I'm pretty fond of, too. Y'all are pretty great. Hope you had a great Thanksgiving and will have a fulfilling run through your holiday season ahead. Gonna need some coffee to keep ya going, it's not the worst idea to spill some of this creamer in at least every once in a while. Happy thanksgiving ������ to you and your family. I completely agree with your take on the madness that the holiday season has unfortunately become. I’m also thankful for all the work you do for this blog! I like how TJ's is creative to cater those other dietary needs. I’m excited to try this! Yay for fun flavors of vegan creamers!! Although i’ll likely add a splash to my (almond milk) hot cocoa, i’m a twit about my coffee and only like a splash of vanilla creamer but not other flavors.